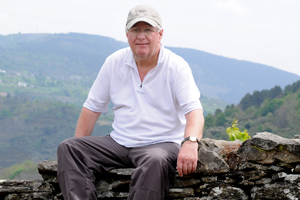 Ian Smith has been a professional for something like 30 years. Nowadays he works as a freelance commercial, portrait and wedding photographer. He also spent 20 years as the Deputy Editor of first, High and then, Climb magazines. His climbing photos have been published in numerous newspapers, books, guides and magazines across Europe and in the States, and also in adverts and catalogs for various gear companies. Virtually anything by John Cleare in his seminal book Rock Climbers in Action in Snowdonia and, if pushed to name one, then the shot of Dave Alcock on Scratch Arete. However, in my home patch of the Peak, Bob Keates’s photo of Geoff Birtles on Right Unconquerable in Hard Rock laybacking up the flake with no runners would also rank very highly. 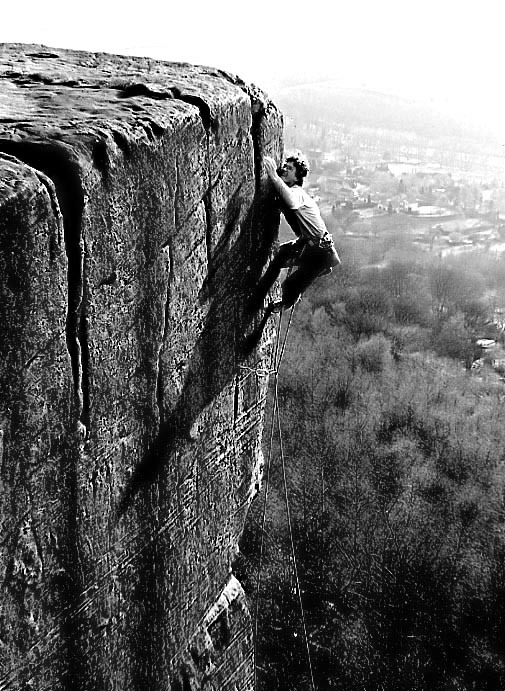 Johnny Woodward on the first ascent of Beau Geste, E7 6c, at Froggatt Edge. Although my heart lies in the Peak and photographing gritstone, probably my most rewarding work was the numerous first ascent photos I took on the island of Jersey. It was an incredibly exciting period back in the mid-80s when we were finding not just new routes but whole new crags in a wild, remote and little known climbing area. I went on to write the first ever guidebook to the island and unfortunately, due to cost restraints at the time, the book had no photos in it other than the cover. Nikon SB 800 flash gun, I’ve always used fill-in flash, and this gun is exceptional for that but also I use it as a commander to add other guns and using flash in a highly controlled way is a great way of dealing with the often low light levels in Britain. I’m also constantly being impressed by the results from my Nikkor 70-200mm f2.8 VR lens. Back in days of film and my Nikon F3 I really liked to use the 50mm f1.4 but probably ended up using the 28mm wide angle more often. Later, when I moved on to the F5 (the best handling camera I’ve ever used) I had a great 28-70mm zoom. Now with digital it’s a 16-85mm VR zoom that gets the most use. Which route would have to be something new and hard on Stanage, just because as a crag it feels like such an old friend. Location would probably have to be sea cliffs, preferably granite, or Corsica which looks amazing and I’ve not been. Climber, that’s hard, but it would be great to shoot Jonny Woodward again after all these years and of modern climbers probably Dave Birkett because I reckon he’d be really interesting company on the crag as well as an amazing climber. Be prepared to work hard and be willing to give up some climbing time. It’s incredibly difficult to both climb and take photographs, so set aside days or half days when you separate the activities and decide to be fully one or the other. Many thanks to Ian for sharing his time with the Climbing Photography blog. It’s a real honour to have you join in after being held up in the Tim Glasby interview as an iconic lensman.